Following a consecutive string of balls-out action spectacles featuring the Indonesian martial art of silat, the bravura Welsh stylist Gareth Evans returns to his home ground for a Gothic horror that needs to be seen to be believed. Yet that statement must come with a responsible note of caution: those who are faint-hearted, or who cannot deal with graphic depictions of snapped necks, crushed limbs and drilled heads, should best stay away, for it does get pretty intense throughout the entire of its third act. The titular religious man here is Thomas Richardson (Dan Stevens), who journeys to the fictional isle of Erisden to rescue his sister Andrea (Lucy Boynton) that has been kidnapped and is being held for ransom. There on the secluded island, he finds a quasi-religious community living under the strict rules of its prophet Father Malcolm (Michael Sheen). It isn’t long after his arrival that Father Malcolm realises that there is an intruder among their midst, but a group interrogation where Thomas by happenstance saves Father Malcolm from an assassin sent by the Government buys him time to continue his search for Andrea. It is clear right from the start that there is something a lot more sinister happening on the island – the soil is toxic, the life-stock cannot seem to give birth, and its community of believers place a nightly offering of their blood in glass jars outside their rooms or houses before they go to bed. But Evans is in no hurry to reveal just what God the community is worshipping, or for that matter, an old woman who keeps appearing to Thomas in his visions; instead, he spends the first hour setting up a number of subplots that you know will eventually come to a head at the same time. There is a naïve young man Jeremy (Bill Milner) having an illicit romance with Ffion (Kristine Froseth), whose father happens to Father Malcolm’s brutish right-hand man Quinn (Mark Lewis Jones); there is also a budding romance between Thomas and Father Malcolm’s daughter Jennifer (Elen Rhys); and last but not least, there is Andrea herself, whom Father Malcolm parades in the village and threatens to kill if her co-conspirator does not step forward. Only after these are established does Evan pull back the curtain to show the true horror – the old woman of Thomas’ dreams imprisoned in tree roots and force-fed blood and entrails, in order that she once again manifest her supernatural powers which had once given life to this community. To Evans’ credit, the movie unfolds with an eerie, slow-burn atmosphere that keeps you intrigued throughout its intricate set-up; but those expecting the same restraint in the latter half of the movie will probably be utterly shocked. So you know what you’re in for, Quinn will discover that Ffion is pregnant with Jeremy’s child, slaughter her for being impure, frame Jeremy for the murder when he returns, and then proceed to advance a cleansing ritual which will see his head pierced from the top with a giant corkscrew. And that is only the prelude to the blood-soaked madness which follows, that we guarantee will leave even the most stout-hearted unsettled. 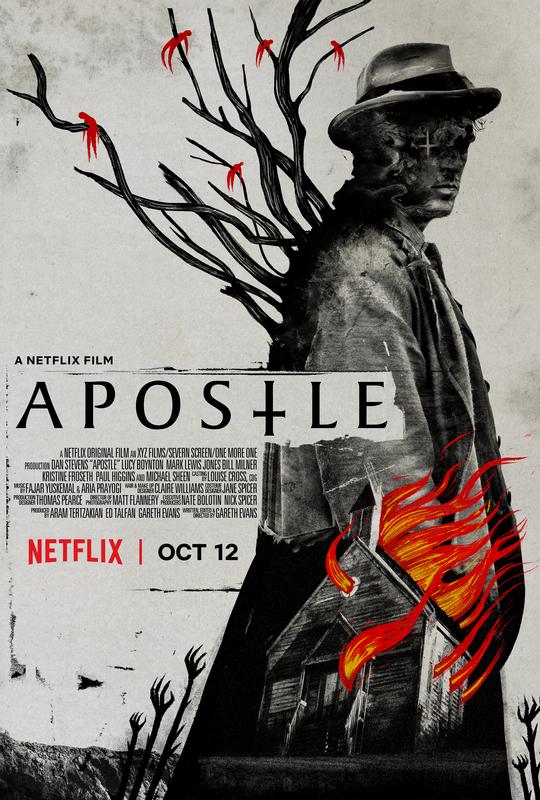 Even for cult-centric movies, we must say that ‘Apostle’ is probably one of the most disturbing of the lot. As over-the-top as its visual gore does get, there is in fact a cautionary tale here about the intoxicating power of religion, which can be so powerful as to make its believers lose all sense of logic or human decency and be exploited by its wielders as a tool of control. It is no coincidence that Thomas happens to be a deeply scarred missionary whose own experience spreading the Word to China recounted in a flashback has caused him to surrender his own faith totally, and what he feels the need to dull himself from every night with opium. Much of the movie rests on the shoulders of Thomas’ evolution from spy to anti-hero, and by association Stevens’ masterfully subdued performance. You’ll most likely recognise Stevens from the upper-crust Crowley clan, but here he strips away all manner of grace for a gritty portrayal of a wounded man who is as in need of redemption as he is to save others. Even when he finally steps up to become the reluctant saviour of the community from its own delusion, Stevens never overplays the role and holds the movie commandingly from start to finish. If it isn’t yet apparent, ‘Apostle’ won’t be everyone’s idea of entertainment, seeing as how brutal and bloody it does get. Yet as a mystery horror, it is confidently mounted and suspensely directed, with much to praise about its art direction, cinematography and sheer atmosphere. Oh yes, among the crop of Halloween-timed new releases this year, Evans’ study of belief, religion and blind worship is truly one of the most original, and perhaps one of the most horrifying to watch. True, Evans has never shied away from savagery even in ‘The Raid’ and ‘The Raid 2’, but this is quite something else; and like we warned you at the start, you’d best prepare yourself for some stomach-churning horror before you Netflix this one in..